…is the “true” medical symbol, ⚕ , and is preferred by medical societies who know what they’re doing, including the AOA, AMA, AAFP, Air Force Medical Corps and Navy Medical Corps. If you once studied Greek mythology you might remember that Asclepius was a God of Healing, and his symbol is a single serpent on a staff. The more symmetrical Caduceus is the symbol of Hermes, messenger of the Gods, as well as the trickster patron god of thieves, travelers and herdsman. Thus making the inaccurate use of Hermes’ symbol hilarious but embarrassing, unless you are a charlatan traveling doctor, and perhaps ideal for television doctors who promote un-scientific quackery. You can blame the confusion about what is the true symbol of medicine on a cultural affinity for symmetry, PR having too much sway, a decision in the early 1900s regarding branding of the US Army Medical Corps, and the fact an average person can’t tell you the difference between the Caduceus and the Rod of Asclepius. Unfortunately, this means many a hospital bears the embarrassment, having listened to the advice of marketers. 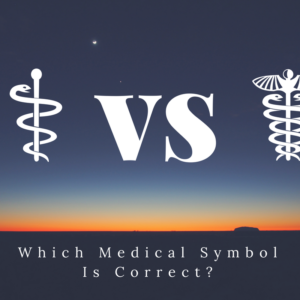 It’s even been the subject of a 2014 study (in the Journal of Clinical and Diagnostic Research), which noted an abysmal percentage of physicians identified the correct symbol. As long as my medical associations continues to use the correct symbol, I can handle being employed by an organization using the other. However, if you’re printing graduation announcements, or have chosen to celebrate graduation with a small medical tattoo, please use the correct symbol. You’re going to be a doctor, not a thief.